How Quantum Mechanics can consistently describe the use of itself. With Mario Hubert. Scientific Reports 9, 2019. 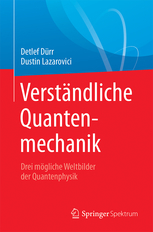 Verständliche Quantenmechanik. Drei mögliche Weltbilder der Quantenphysik. A minimalist ontology of the natural world. 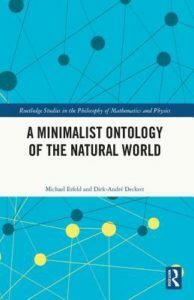 Routledge Studies in the Philosophy of Mathematics and Physics. Routledge, 2018. Against Fields. European Journal for Philosophy of Science 8(2), pp. 145-170, (2018). DOI: 10.1007/s13194-017-0179-z. Relativistic Interactions and the Structure of Time. In: A. von Müller, T. Filk (eds. ), Re-Thinking Time at the Interface of Physics and Philosophy. On thinking Vol. 4, Springer, (2015). Lost in Translation: A Comment on ‚Noncommutative Causality in Algebraic Quantum Field Theory‘. In: Galavotti et al. (eds.) New Directions in the Philosophy of Science. The Philosophy of Science in a European Perspective, Vol. 5, Springer (2014). Quantenphysik ohne Quantenphilosophie. With Detlef Dürr. In: M. Esfeld (ed. ): Philosophie der Physik. Suhrkamp, Berlin, (2012). Der Dialog des Demokrit. With Detlef Dürr. In: Nida-Rümelin and E. Özmen (eds. ): Welt der Gründe. Proceedings des XXII. Deutschen Kongresses für Philosophie, Meiner Verlag, (2012). How Quantum Mechanics can consistently describe the use of itself. With Mario Hubert. Scientific Reports 9, (2019). A mean-field limit for the Vlasov-Poisson system. With Peter Pickl. Archive for Rational Mechanics and Analysis 225(3), pp. 1201-1231, (2017). DOI:10.1007/s00205-017-1125-0.